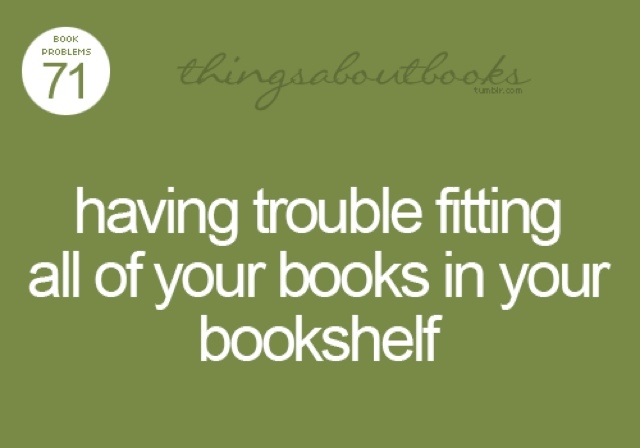 I really do have this problem! I now have books stacked up against other books thereby destroying my once beautifully organized shelves. Eventually, I'll end up with books on the floor again. Time to head off to Ikea again I think! I guess I should stop soon before I run out of wall space but there are just too many good books to read and more being released every month. I suppose some people would recommend a ebook reader thingy to keep the piles down somewhat but I just can't enjoy a book in digital form. I have tried, I read Jane Eyre, or tried to but halfway through I picked up a paper copy instead. So, either I get help for my book shopping addiction or I buy more shelves!! !